I’m not completely sure that real leprechauns like play dough, but these St. Patrick’s Day activites for kids are lots of fun! 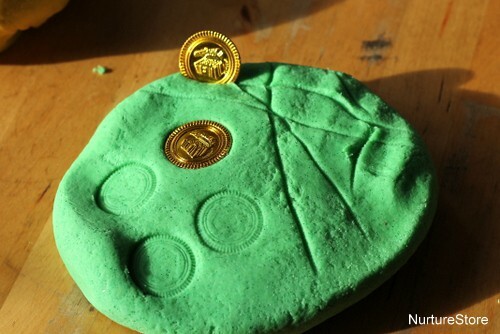 St Patricks Day activities for kids :: Leprechaun’s play dough! 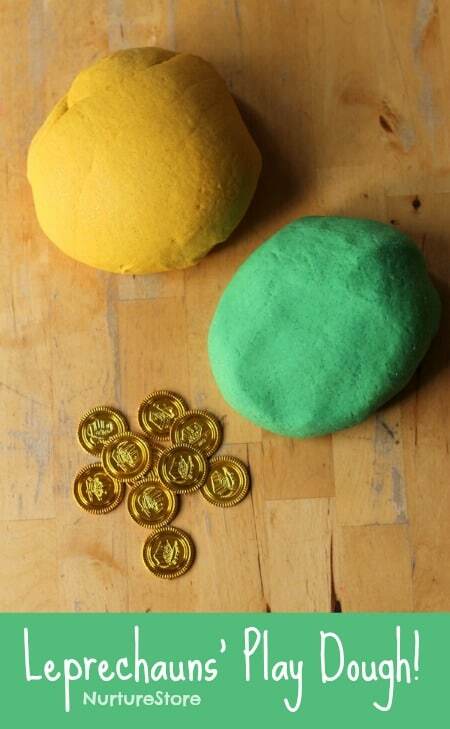 For a fun St. Patrick’s Day play time for your children, how about some homemade gold and green play dough? I always make my own play dough – my children love to request particular colours, and the home made stuff is so much cheaper, which means we can make a generous amount for lots of play. 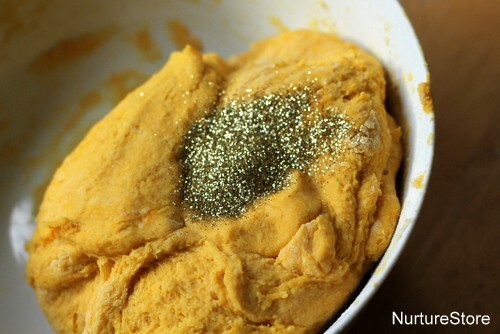 You can make the play dough in minutes: I used this easy play dough recipe, adding some yellow food colouring gel to one batch, and some green to a second – along with lashings of glitter! 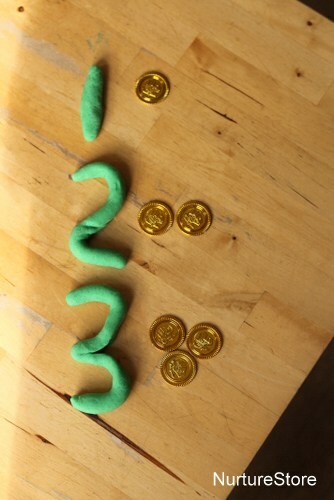 We added in some gold coins and the children discovered they were great for printing and making patterns. They printed with the flat circles of the coins, and rolled them along on their sides. 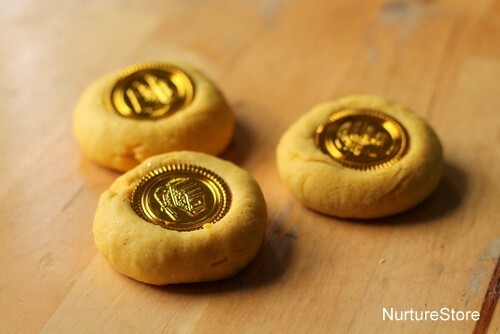 You could set out the play dough with the gold coins hidden inside, and invite the children to go digging for treasure! 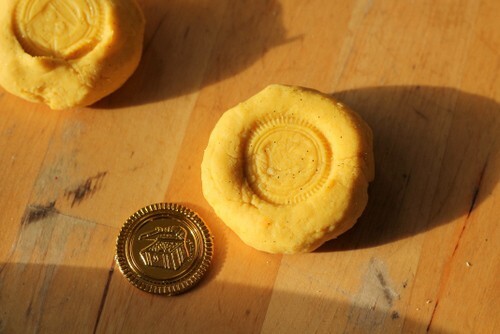 The children also made their own gold coins from the play dough. The dough is so soft and squishy that it’s a delight to play with. 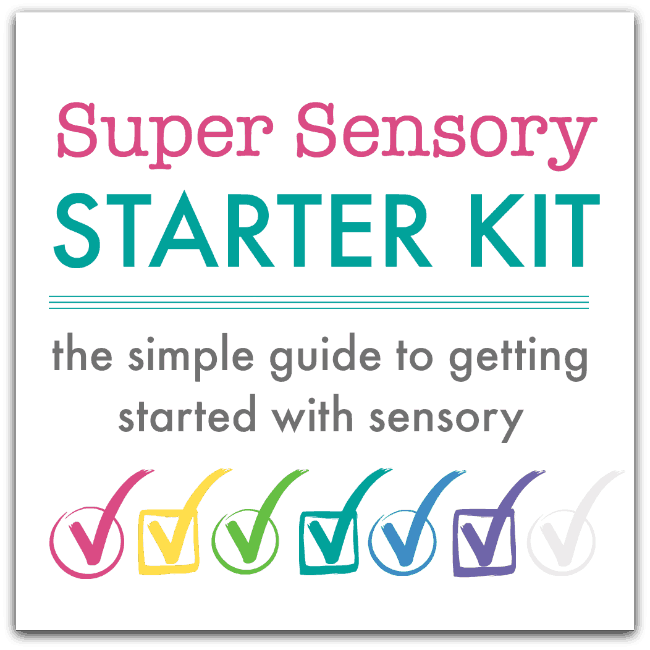 And as the children play they are building up strength and dexterity in their fingers and wrists – great fine motor skills. You know leprechaun’s like to keep careful watch over their gold, so no-one steals it, right? Better make sure it’s all there and count those coins! Shaping the dough into numbers helps children really get to know the formation of written digits, and is a great sensory alternative to just writing with a pencil on paper.